Datalogic Automation introduces a new line of encoders for smart motion control in industrial automation applications. Datalogic’s new Encoder product line is a complete range of incremental and absolute rotary encoders for industrial automation applications such as motion control, length measurement and positioning. The new products further expand Datalogic’s portfolio to provide their customers with a comprehensive technology offering. Datalogic’s range of encoder products includes the ENC41 Incremental Encoder basic line, ENC58 Incremental Encoder extended line, AST58 Absolute Single-Turn Encoder line, and AMT58 Absolute Multi-Turn Encoder line. ENC41 incremental encoders offer a compact size and cost-effect pricing due to their Ø41 fibreglass epoxy case, without compromising robustness and overall performance. ENC58 incremental encoder extended line has an industrial standard Ø58mm metal case, and offers a wide range of mechanical variances, with resolution from 500 to 10.000 PPR, as well as a programmable version. 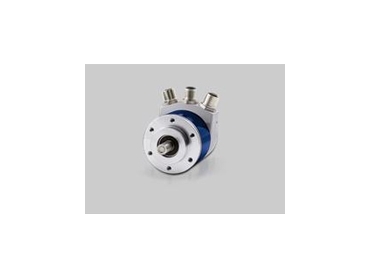 AST58 absolute single-turn encoders, available in a standard Ø58mm metal case, offer a resolution up to 13 bit, Gray SSI output, a Ø15mm hollow shaft and a Ø6mm or 10mm solid shaft, all available with either M12 or M23 cable connection. AMT58 absolute multi-turn encoders offer all the features of the single-turn version, plus a multi-turn 13x12 bit resolution in the Gray SSI model, or 16x14 bit resolution in the Fieldbus version, which includes CANopen, Devicenet, EtherCAT, Profibus, and Profinet. Datalogic’s new Encoder line is supported by a wide range of encoder accessories including mechanical couplings, mounting fixtures, connectors and cables, as well as metric wheels and draw wires for linear measurement applications.